Sugar Reef is a beautiful eco-luxury hotel located on the island of Bequia in St.Vincent and The Grenadines. Known as both the best restaurant, and one of the best hotels on the island, Sugar Reef has made a name for itself by having lovely staff, a beautiful location and a professional chef (Chef John) who cooks up delicious meals every day. The natural feel of the hotel grabs visitors as soon as they enter, with stunning drift wood furniture and local art adorning the main lobby & dining area. This is definitely one of the most unique boutique hotels we’ve ever stayed at. We received a very warm welcome at Sugar Reef when we arrived. Even though we checked in 4 hours early, the staff kept us company while we waited for our room to be prepared and they even offered us a free breakfast, something you don’t usually get on the day you check in! Each member of staff greeted us that day, and was exceptionally friendly throughout our stay. The manager, Judit (pronounced Yudit) also sat and chatted with us for quite a while during check in. She was genuinely interested in meeting us and she told us about many of the things to do around the hotel. Check-in was delightfully informal and we were offered a welcome rum punch and a delicious breakfast. We stayed in the beach front villa and it was absolutely stunning. Fashionable stone walls complimented the driftwood furniture, art and decor that is found all over the hotel. 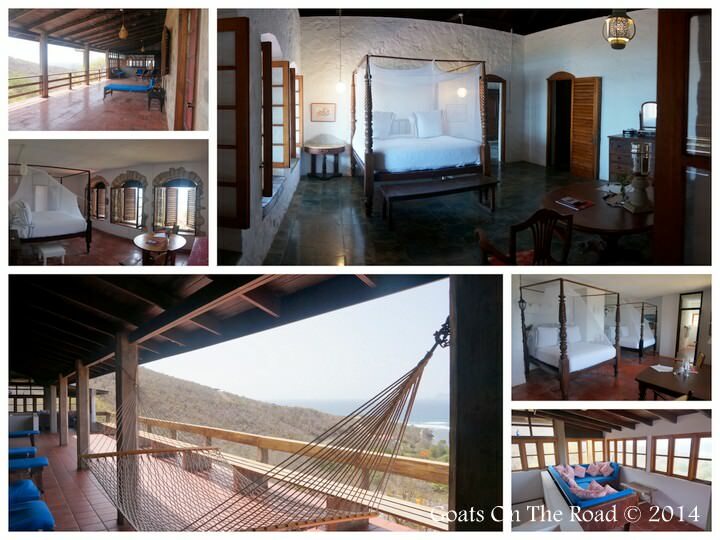 Our massive four-poster bed was extremely comfortable, and we had a perfect sleep every night…. who wouldn’t sleep with the sound of the ocean lapping up at the front door! There was a mosquito net, but because the room was completely screened and bug-free, we didn’t have to use it for the duration of the stay. We would have liked to see a 4-poster mosquito net but because we didn’t need to use it, we weren’t too concerned. We had a nice little patio area that looked right out to the water. The beach front rooms were steps from the sand and there was a funky hammock hanging between two palms right in front of our patio. There are 3 beach rooms in a single building facing the ocean. Each of these rooms are the same and their front patios are separated by a small brick barrier. A higher barrier would have been a welcomed improvement, so that each deck had complete privacy from it’s neighbours. But really, with the beach straight ahead, there’s no reason to look anywhere else! Sugar Reef Estate is split into two separate areas. There is the restaurant and dining area, along with the three beach rooms right on the water. Up the hill and through the lush coconut plantation, there is the massive French House, which has another 5 rooms. Each room in the French House is completely different, but all come with the charming plantation home ambience and the tasteful local dark wood furniture and decor. The views from the French House are absolutely sublime, and if you decide to stay up here, we highly recommend the Master Suite which we think is the most beautiful room in the hotel and possibly on the entire Island! 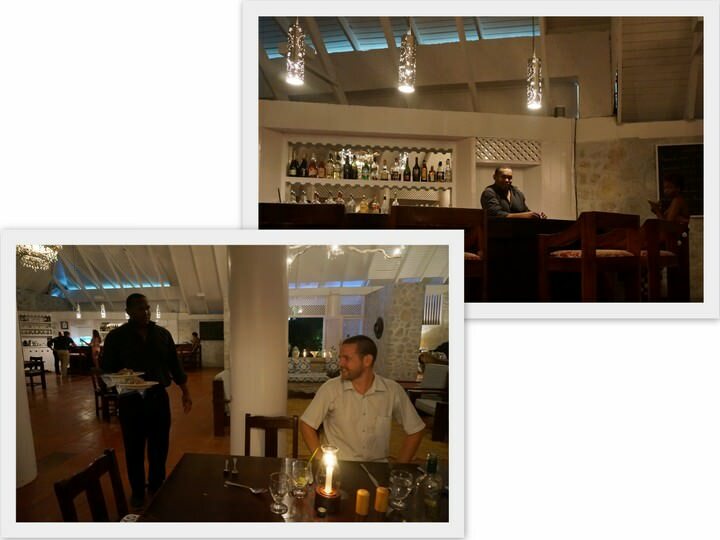 Thanks to professionally trained Chef John, the food at Sugar Reef is fantastic. Meals are eaten in the dining room which looks out over the dazzling beach. In the morning, the cool breeze blows in as guests enjoy a delicious complimentary breakfast. Lunch can be served at any time, and at dinner service the dining room truly lights up. Each table is set with a single glowing candle and light dinner music is played over the speakers. Even though dinner service appears to be formal, there is still the same casual atmosphere that really makes Sugar Reef special. 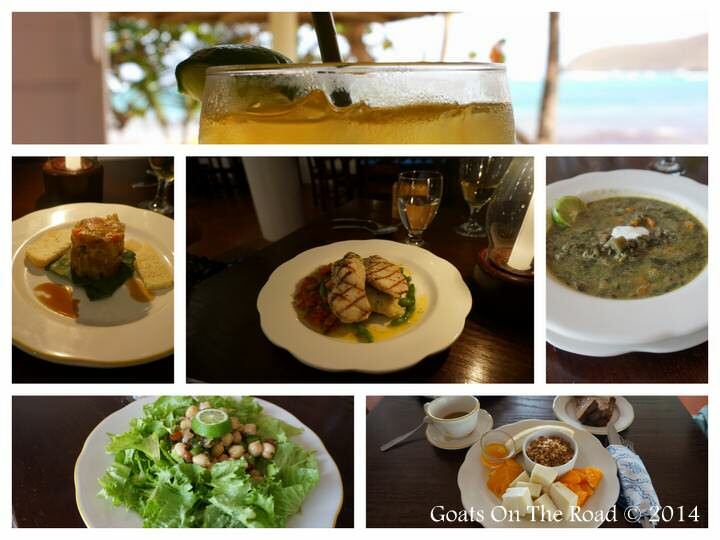 We tried almost everything on the menu and not once were we disappointed with the food. My personal favourite was the tuna tartar appetizer (which I ate every day) and Dariece couldn’t get enough of Chef John’s mahi mahi. 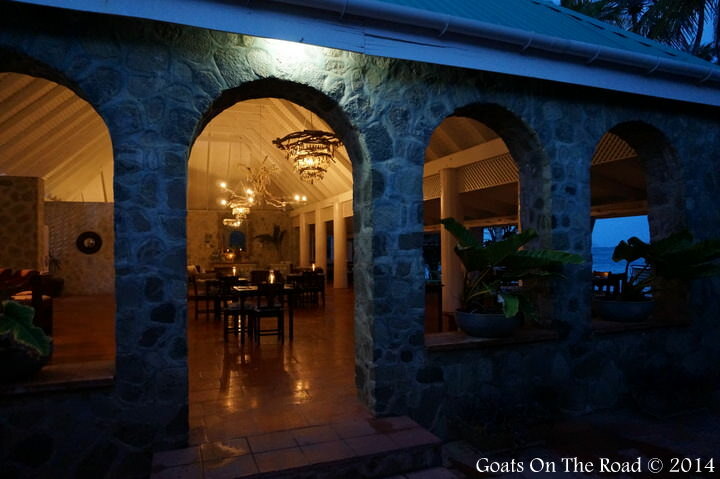 Many people say that Sugar Reef has the best restaurant on Bequia Island and after eating here 3 meals / day, three days in a row, we can honestly say that we agree. These days, hotels and luxury accommodation are becoming less and less personal. Huge, sprawling structures are cropping up on beaches all over the Caribbean, some with over 100 staff! Sugar Reef is refreshingly cozy and intimate with just 12 members of staff, each one genuinely interested in their guests. This hotel prides itself on having a family feel and it definitely succeeds at giving guests a warm welcome and a comfortable stay. There is no pool, air conditioning or spa at Sugar Reef, but these types of amenities simply wouldn’t meld with the eco-friendly, natural vibe of the hotel. 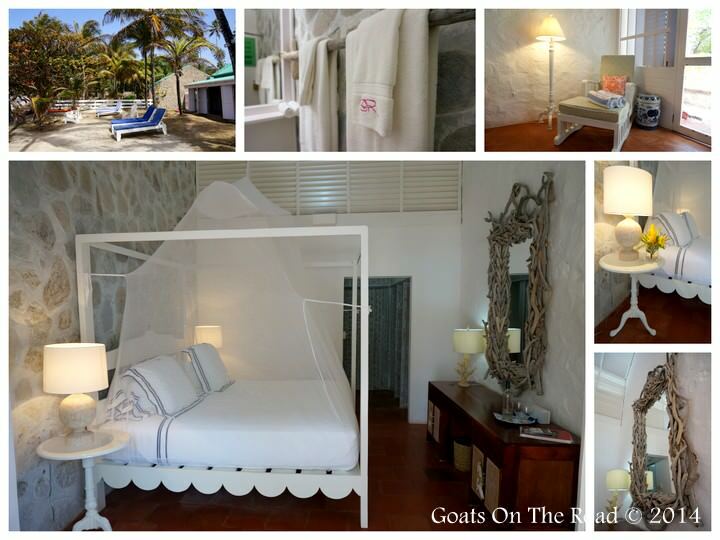 What you do get here are stunning rooms, set close to the sea on a beautiful plantation estate. There are plenty of walks both through the hotel grounds and up into the surrounding hillsides. One particular walk will take you to Bequia Head at the very end of the island, where you have beautiful views of the other islands in the Grenadines chain. The rooms come with daily cleanings and turn-down service, as well as endless fresh water and a complimentary breakfast. The beach in front of the hotel is stunning, but when we were there some moss had moved in and darkened the water a bit. We were told that this happens periodically but never lasts more than a couple of weeks. They even have board games and a real espresso machine! Perfect for rainy days. Kayaks, snorkel gear and bicycles are offered to guests free of charge. You can explore for hours and never even leave the hotel grounds. The estate that Sugar Reef sits on is stunning and the walk between the beach rooms and restaurant, up to the French House is great exercise. There are hundreds of palm trees and blossoming flower bushes all around the property ,and the drive in looks like something from a springtime post card. 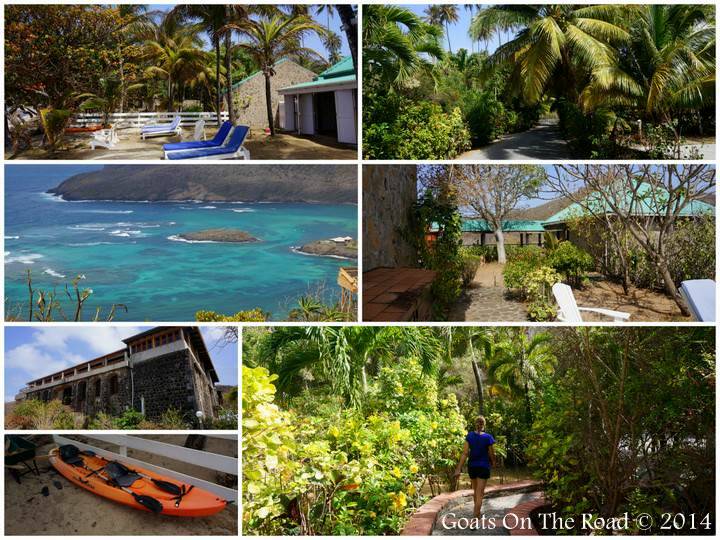 Sugar Reef probably sits on the most gorgeous plot of land on Bequia island. Room rates do not include 10% Government Tax (VAT) and 10% Service Charge. Rates, in US dollars, include wifi, daily maid service and continental breakfast. We chose to stay at Sugar Reef for Dariece’s 30th birthday and we’re very happy we did. We couldn’t have asked for a more relaxing, comfortable and enjoyable stay. The staff was very attentive and they planned a special birthday cocktail and desert for Dariece. Three of the wait staff even sung a Caribbean version of happy birthday for her. We looked at every room in the hotel and each has its own character and charm. The rooms in the French House vary greatly in size and appeal, but all are clean, comfortable and well furnished. The Master Suite is by far the most beautiful room in the hotel. What really made Sugar Reef stand out was the staff. Rarely do you find such kind and committed staff in this part of the world and Sugar Reef has great service in spades. It’s very hard to leave! Check Out Our Accommodation Spotlight Video For Sugar Reef! From the moment we checked in, until the moment we left, we were treated like friends and family and it was that unique atmosphere that really made Sugar Reef stand out for us. We became great friends with the manager Judit and we hope to one day return for another glorious stay. We highly recommend Sugar Reef for anyone looking for a one of a kind eco-luxury hotel in the Caribbean. Want to stay in this gorgeous place? You can book your room here! A big thank you to Sugar Reef for hosting us during this portion of our stay on Bequia Island. As always, all reviews, thoughts and opinions remain our own. This looks like a great place to spend a holiday. I know, right?! It’s gorgeous. I especially loved the driftwood framed mirror and the awesome staff. Wow! Amazing, looks so serene. A great place to go and de-stress! Just read your comments and watched your video. We have booked 10 days in January at Sugar reef and your website hopefully confirms our choice as a good one. Thank you. Great to hear! We really enjoyed our stay at Sugar Reef. If you can rent a car, that would make your stay even more enjoyable, or, you could just hire a taxi for the day, or walk to the other areas of the island in about 45 minutes to an hour. Will you be staying in the beachfront rooms or the plantation rooms? Travel and enjoy your vacations because you deserve it.